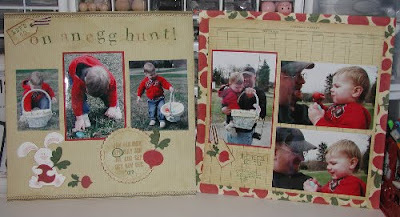 Wolf Creek Crafting: Let's Go on an Egg Hunt! After weeks of really bitter temps, we might actually get into the 40s the next couple of days. It'll feel downright springlike, I think! So it's appropriate that I would share an Easter layout with you today. 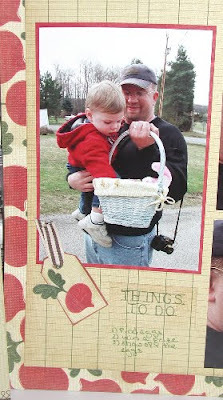 I've been holding on to these photos of my son and hubby at our church's annual Easter egg hunt. Most Easter paper and embellies are pastel and just didn't seem to work with the darker colors in these pics, and so the photos have sat and waited. Then Rich gave me DCWV's Berry Street Farmers' Market stack for Christmas - perfect! Ronan would have been not-quite two in these photos. Hope there's some spring in your step and a little sun in your sky today!